Services and Compensation: The Customer agrees to pay Collegiate Storage and Rental LLC (CSR) for the services rendered according to our published schedule of prices. Safe Packing: The Customer is responsible for the secure packing of their possessions and for reading the Collegiate Storage and Rental LLC Packing tips available online. THE CUSTOMER IS ADVISED NOT TO PACK ANY FRAGILE ITEMS AND OR ITEMS WITH A VALUE IN EXCESS OF $250. THE CUSTOMER ASSUMES FULL RESPONSIBILITY FOR USING OUR SERVICE TO STORE THESE ITEMS. EXAMPLES OF SUCH ITEMS ARE GLASS, COMPUTERS, LAPTOPS, CELL AND SMARTPHONES, CASH, COINS, JEWELRY AND OTHER VALUABLES. Insurance: Collegiate Storage and Rental will insure each box package for a maximum $250.00. The Customer acknowledges that Collegiate Storage and Rentals’ liability will be limited to $100 per item inside each box package. Payment Authorization: The Customer authorizes Collegiate Storage and Rental to charge the credit card or bank account at the time of order. Please review our complete Terms and Conditions below. Storage Services shall include the pickup from designated locations, transportation, storage, and delivery to designated locations of the Customer’s possessions. The Customer shall present pre-packed personal goods to CSR at the time of pickup. CSR shall transport these goods to our appropriate storage facility. CSR will return the goods to the Customer during dates and times established by CSR after considering school and dormitory schedules. Customer agrees to be present to receive the goods at the specified delivery date, time, and location. Customers moving off campus will be charged a $50.00 handling fee. Customers moving into any location without a working elevator or requires the items to be lifted up stairs will be charged $50.00 per floor Handling Fee. The Customer understands that access to goods in storage is permitted only with 14 days prior notice to CSR and upon payment of a non-refundable fee as per the Pricing section below. If the items must be delivered prior to the specified delivery dates, an additional fee will apply as per the Pricing section below. Changes to the previously scheduled delivery date or location must be communicated by the Customer to CSR at least 14 days prior to the earlier of the originally scheduled delivery date and the new delivery date. Changes made within 14 days of delivery are not guaranteed. An additional fee may be assessed as per the Pricing section below. During the sign up process the Customer is required to make sure the right billing address match the person’s name on the credit card. The Customer hereby authorizes CSR to charge the Customer’s credit card or bank account for the price of the the services rendered. The Customer recognizes that CSR will not be held liable for damage to the Customer’s belongings after delivery has occurred. In the event that the Customer is not present during the Customer’s scheduled delivery date and time, CSR representatives will bring the Customer’s belongings back to the warehouse and the Customer will have to reschedule the delivery. If this happens, the Customer will be responsible for paying a redelivery fee and or a missed pickup fee of $100.00. The Customer recognizes that only loss or damage caused by the negligence of CSR will be covered by the CSR declared value policy, as described in these Terms and Conditions. Only physical damage to the exterior of the item will activate any claim on the item. a. The Customer was present in the Customer’s residence throughout the applicable four-hour window. b. In the case of pickup, the Customer has all packages packed, labeled, and prepared for pickup prior to CSR’s arrival. c. In the case of the delivery of stored goods, the Customer has correctly labeled each of the Customer’s packages with the Customer’s name. d. CSR is notified in writing or by telephone of a service failure within seven calendar days from the date of the scheduled pickup or delivery. e. The guarantee does not apply if the failure to perform within the pickup or delivery window is due to causes beyond CSR’s control including, but not limited to, the following: the unavailability or refusal of a person to accept delivery of the stored items; acts of God; public authorities acting with actual or apparent authority on the premises; acts or omissions of police or campus security similar authorities; riots, strikes, or other labor disputes; civil commotions; disruptions in ground transportation networks, such as weather phenomena; and natural disasters. CSR will not store or ship packages containing liquids, and the Customer acknowledges that the Customer is liable for any damage that the Customer’s storage contents may inflict on the property of others. CSR reserves the right to refuse any package that by reason of the dangerous or other character of its content, is liable, in the judgment of CSR, to soil, taint, or otherwise damage other merchandise or equipment, or that is economically or operationally impractical to transport, or that is improperly packed or wrapped. CSR reserves the right to open and inspect any package tendered to it for storage or shipping. The Customer acknowledges reading and accepting the terms of the CSR Packing Tips as found on the CSR Web site and agrees that the safe packing of items is the sole responsibility of the Customer. The Customer agrees to pay the total cost of the services provided by CSR based on the number and type of items tendered to CSR at the time of pickup, the exact services to be provided, and the prices contained on the CSR web site. The Customer agrees to pay multiple semesters in full at time of pickup (e.g. For Study Abroad Customers — Spring and Summer semesters are billed together at pickup). The Customer further agrees to pay any applicable fees as specified in the Pricing section. These fees are non-refundable in the event the student does not return to school for the Spring semester. All charges for services are due and payable when you order. All accounts must be paid by credit or debit card. The Customer hereby authorizes CSR to charge the Customer-provided credit card or bank account for the balance owed for the services rendered and any additional fees. Checks or cash are not accepted on the day of pickup and should not be given to CSR representatives under any circumstance. The Customer acknowledges that the Customer remains indebted to CSR for any balance owed on the Customer’s account as a result of invalid credit or debit card information, CSR’s inability to receive credit or debit card charge authorizations, or for any other reason that prevents CSR from being paid for the services and any additional fees. If the Customer has failed to pay the charges for the services or any additional fees prior to the date of scheduled delivery of stored packages, CSR reserves the right to hold the Customer’s possessions until payment has been received in full. The Customer acknowledges that the Customer’s failure to pay the Customer’s account in full prior to the delivery date could result in a change in the delivery date and the assessment of additional fees. In addition, if the Customer has failed to pay charges for the services or any additional fees of the stored packages, CSR may, without demand, sell or otherwise dispose of any or all of the Customer’s stored items at public or private sale upon such terms as CSR may deem advisable. Notice of the time and place of any public sale, or of the time at which a private sale or other intended disposition of the stored items (or any portion thereof) is to take place, given at least ten (5) days in advance shall be deemed reasonable notice to the Customer. CSR will apply the net proceeds of any sale of stored items, after deducting all costs incurred in connection therewith, including reasonable legal fees, to the payment, in whole or in part, of the payment obligations of the Customer to CSR. If there is a surplus, CSR will pay the amount of the surplus to the Customer. On the other hand, if the net proceeds of any sale of stored items are insufficient to cover the unpaid amount of al obligations then due from the Customer to CSR, the Customer shall continue to be liable to CSR for such deficiency and CB shall have full recourse against the Customer for the amount of such deficiency. CSR automatically protects each CSR storage and shipping package against loss or damage due to CSR’s negligence up to a value of $250.00. To the extent that the Customer does not declare value for the full value of the Customer’s personal property stored or shipped with CSR, the Customer hereby agrees to assume all risk of loss, including damage or loss by burglary, fire, vandalism or vermin. CSR and CSR’s , representatives and employees will not be responsible for, and the Customer hereby releases each and all of them from, any loss, liability, claim, expense, damage to property or injury to persons that could have been declared (including without limitation any loss arising from the active or passive acts, omission. c. Damage to electronic equipment if there is no evidence of physical damage or breakage to the packaging container. j. Any damage caused by an event of force majeure. l. Damages due to natural disasters, and any and all loss or damages occurring while the items are not in the possession of CSR. Damaged items must have evidence of physical damage to the exterior packaging of the item. CSR cannot be held liable for concealed damage to items within a carton, trunk, or other casing without physical damage to the exterior of the package. Notwithstanding anything to the contrary contained in this Agreement, CSR’s maximum liability for any damage, loss, cost, or expense incurred as a result of any storage by CSR is limited by the terms included in this Agreement. All declared value coverage is expressly limited to the period in which the Customer’s possessions are in the actual care and custody of CSR. The Customer agrees to make a claim for any loss first against any declared valuation carried by the Customer or the Customer’s parents, if available. The Customer will make claims against CSR only after exhausting other areas of coverage. In the case of damage to stored packages, any damaged cartons must be inspected in the presence of a CSR representative at the time of delivery to confirm damage. All damaged boxes must be opened at the time of delivery, at which time the CSR representative will document the damage. For loss of stored packages, the Customer must notify the CSR representative of the loss at the time of delivery of the other packages and sign the delivery receipt amended for the lost package. The missing items must be noted on the form and signed off by the CSR representative. If the Customer is not present during the time of delivery, the condition notes recorded on the contract, if any, will determine the existence and extent of damage or loss. • The amount of additional declared value the Customer purchased for the item plus the $100 of free declared value. It is hereby expressly agreed that CSR shall have no liability if any claim is denied or paid in part by the Shipping Carrier or its declared valuation company. Without limiting the right of CSR to conclude for other reasons that the Customer will not be returning to school, the Customer agrees that the Customer’s failure to be present on the scheduled delivery day and the Customer’s failure to communicate with CSR concerning an alternate delivery arrangement constitutes abandonment of their stored possessions. In the case of abandonment of the Customer’s possessions, the Customer agrees to pay CSR for all charges and fees relating to the failed delivery attempt and for any disposal fees of the Customer’s items. CSR has the right to assume ownership of the abandoned property on December 30th of the service year if the Customer has failed to contact CSR about delivery and/or has not paid for current storage fees. This Agreement shall be governed, interpreted, and construed according to the law of the NEW YORK STATE. The Customer agrees that any court action pertaining to this Agreement shall be conducted in the state courts of the NEW YORK CITY COURTS or in the federal courts located therein. The Customer acknowledges that there are no representations, warranties, or agreements by or between the parties that are not fully set forth herein and no representative of CSR or CSR’s agents is authorized to make any representations, warranties, or agreements other than as expressly set forth herein. This Agreement may be amended only by a writing signed by the parties. Services and Compensation: The Lessee agrees to pay Collegiate Storage and Rental LLC (CSR) for the services rendered according to our published schedule of prices. Returning the unit: The Unit must be clean and defrosted 24 hours prior to the scheduled delivery. The following paragraphs contain the general terms and conditions under which Collegiate Storage and Rental, LLC (“CSR”) is engaged in the movement, transportation, and leasing of “compact cube”, “large fridge”, “fridge/freezer” and “MicroChill” (which are hereby referred to as Unit) within the NEW YORK STATE areas to the Lessee (which are hereby referred to as Lessee). CSR reserves the right to amend any portion of this service explanation at any time. The most current service explanation may be found at the CSR Web site (www.collegat.us.com) and is available upon written request from the CSR main office. RENTAL SERVICES Rental Services shall include the drop-off to designated location, maintenance service, and pick-up from designated location. CSR will drop-off the Unit to the Lessee during dates and times established by CSR after considering school and dormitory schedules. The Lessee agrees to be present to receive the goods at the specified delivery date, time, and location. Prior to May 1, CSR will notify the Lessee of the proper time and pick-up date on which to return the unit. This pick-up date will be no earlier than two weeks prior to the start of the semester’s final exams week. The Lessee must return the unit at the specified time and date or contact CSR at least 10 days in advance to make other arrangements. If the Lessee fails to determine the correct return date and does not return the unit on time, the security deposit will be forfeited, and the Lessee will be charged for the unit. Return date will also be posted on our website at www.collegiate.us.com no later than two weeks prior to pick up dates. Lessee is responsible to familiarize themselves with return date. time and location. DELIVERYCSR hereby leases to the Lessee a unit at the location specified on this invoice. In the event that the Lessee is not present during the Lessee’s scheduled delivery date and time, CSR representatives will bring the Unit back to the warehouse and the Lessee will have to reschedule the delivery. If this happens, the Lessee will be responsible for paying a redelivery fee and or a missed pickup fee of $100.00. a. The Lessee was present in the Lessee’s residence throughout the applicable four-hour window. b. In the case of pickup, the Lessee has the Unit clean, defrosted and ready for pickup prior to CSR’s arrival. c. CSR is notified in writing or by telephone of a service failure within seven calendar days from the date of the scheduled pickup or delivery. d. The guarantee does not apply if the failure to perform within the pickup or delivery window is due to causes beyond CSR’s control including, but not limited to, the following: the unavailability or refusal of a person to accept delivery of the stored items; acts of God; public authorities acting with actual or apparent authority on the premises; acts or omissions of police or campus security similar authorities; riots, strikes, or other labor disputes; civil commotions; disruptions in ground transportation networks, such as weather phenomena; and natural disasters. The Lessee agrees to pay the total cost of the services provided by CSR based on the number and type of items tendered to CSR at the time of pickup, the exact services to be provided, and the prices contained on the CSR web site. The Lessee further agrees to pay any applicable fees as specified in the Pricing section. These fees are non-refundable in the event the Lessee does not return to school for the Spring semester. All charges for services are due and payable when the order is placed. All accounts must be paid by credit or debit card. The Lessee hereby authorizes CSR to charge the Lessee-provided credit card or bank account for the balance owed for the services rendered and any additional fees. The Lessee acknowledges that the Lessee remains indebted to CSR for any balance owed on the Lessee’s account as a result of invalid credit or debit card information, CSR’s inability to receive credit or debit card charge authorizations, or for any other reason that prevents CSR from being paid for the services and any additional fees. If the Lessee has failed to pay the charges for the services or any additional fees prior to the date of scheduled delivery, CSR reserves the right to hold the Lessee’s Unit until payment has been received in full. The Lessee acknowledges that the Lessee’s failure to pay the Lessee’s account in full prior to the delivery date could result in a change in the delivery date and the assessment of additional fees. The Lessee will pay CSR $100 for any “compact cube,” $150 for any “large fridge” $300 for any “fridge/freezer,” and $500 for any “MicroChill” unit not returned. There will be no refunds given for cancellation of rental at any time for any reason. Mid-semester and mid-year cancellations require immediate notification. It is Lessee’s responsibility to make arrangements to secure the unit and provide CSR with information necessary for the return of the unit, i.e. name of contact person, telephone number, etc. Lessee will return the unit cleaned and defrosted. Do not defrost unit with sharp objects. Doing so will destroy the unit and void damage waiver. Let the unit defrost by unplugging or use a hair dryer. The Lessee shall not remove the unit from location specified on this invoice without notifying CRS in writing. The Lessee shall not sublet the unit without notifying CSR in writing. Security deposit will otherwise be returned upon the surrender of the equipment to CSR at the end of the term. If the Lessee fails to determine the correct return date and does not return the unit on time, the security deposit will be forfeited, and the Lessee will be charged for the unit. CSR will reapir or replace the unit if it does not provide normal service during the term of this agreement. There will be no charge to the Lessee unless malfunction or damage was due to the negligence or acts of the Lessee. Without limiting the right of CSR to conclude for other reasons that the Lessee will not be returning to institution, the Lessee agrees that the Lessee’s failure to be present on the scheduled delivery day and the Lessee’s failure to communicate with CSR concerning an alternate delivery arrangement constitutes abandonment of the Unit. It is understood and agreed that the unit at all times remains CSR’s and it is pointed out that the sale of leased property or a failure to return leased property to its owner may constitute a crime and subject the Lessee to prosecution. Lessee agrees to pay attorney’s fees, collection charges, and any other expenses incurred by CSR in collecting any charges under this agreement or in re-taking the said rental property or in otherwise enforcing the terms of this agreement. Lessee shall indemnify CSR against all loss or damage arising from the use of the unit during the term of this lease. Liability for injury, disability, and death caused by the operation of this refrigerator during the rental term shall be assumed by the Lessee, and the Lessee shall indemnify CSR against all such liability. Theft and Damage Waiver. 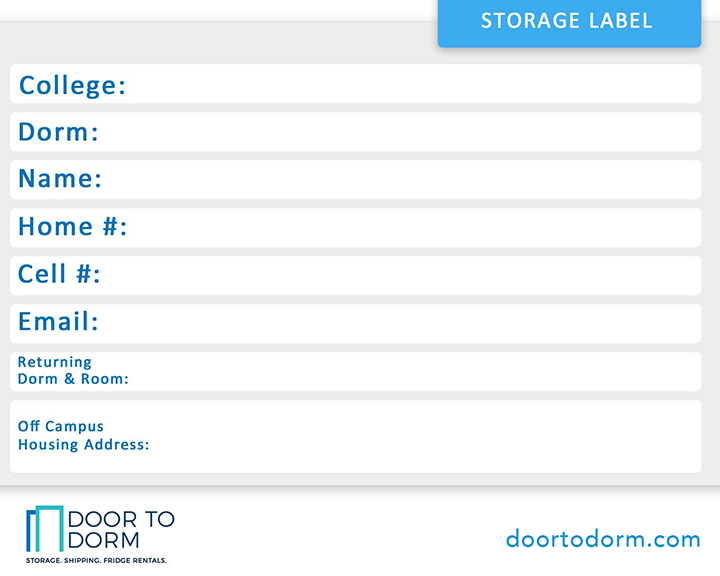 This optional charge protects the Lessee if the unit is stolen from the Lessee’s properly locked residence hall room. The theft of the unit must be reported to the campus police or public safety officials. After a thorough investigation by the proper authorities and CSR, the student will not be charged for the unit, if it is stolen from a Lessee’s properly locked residence hall room. This waiver applies only to the theft of a unit that is reported to CSR prior to April 20th of the rental term. Student will not be charged for accidental damage to the unit including damage or loss to microwave glass, shelves, exterior, puncture of freezer if the waiver is selected and paid for. This waiver only applies to accidental damage and does not cover malicious vandalism or purposeful attempts to damage the unit. In the event that the unit is damaged, the waiver will limit the Lessee’s loss to the money paid for the waiver and the security deposit. Student will not receive a new unit if the unit is damaged, unless a new contract is filled out and theft and damage waiver payment is made for another unit.